Captain Jack Sparrow returns for another action-packed sea voyage in Pirates of the Carribean: At World's End, the third (and hopefully final) entry in the Pirates of the Carribean saga. I'll just go out and say it, the first Pirates one of the best times I had seeing a movie. Not necessairly because of the content, or even because of Johnny Depp's peformance, but because no one knew what to expect from it. There were no expectations of what the film should be like. Everyone was on the same page when "The Curse of the Black Pearl" opened, and it ended up being one of the most orginal action-films ever made. 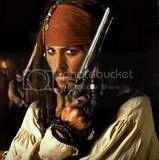 Outside of Johnny Depp, Pirates of the Carribean had vibe that was distinictly its own, mixing your typical pirate swash-buckler with the supernatural elements found in the Disneyland attractions. Completely fresh and unexpected, Pirates was the surprise hit of the decade. I couldn't wait to see how the sequels were going to turn out. Arrrrr! Even ol' trusty Johnny Depp seems bland in this sea voyage. Make him scrub the planks, I say! To be quite fair, there were a few things I liked about this movie. The special effects were superb, the acting was reasonably good, and the final battle was really mind blowing. But wait... I think I've seen this movie somewhere before. *Goffy performance by Johnny Depp: check! *Constant switching of sides made by crew: check! *Funny parrot that speaks everyone's mind: check! *Pirate guy with the funny eye... oh forget it! 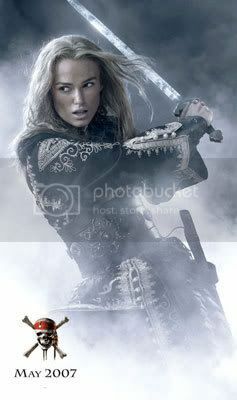 Keira Knightly is cuuuuttteeee in this movie! 0_0 No words can describe. In other words, everything that's amusing in this film was three times better in the orginal. 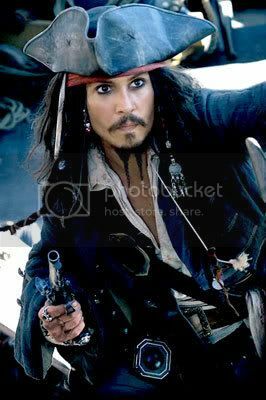 Save your money and watch "Curse of the Black Pearl" another dozen times. If you've just gotta see how the entire story comes together, then you're probably going to see this anyways. Don't say I didn't try to warn you. Not a bad movie by any stretch, just a bland and uninspired one. Unless Disney seriously improves their game plan, we're no doubt in for more generic Pirate sequels. Arrrrrrr! Captain Kaleb says: "All carbon copies should walk the plank!" I'm almost begginning to hope this is the "End" of the Pirates franchise. It was fun, until you got all serious 'trilogy' on me. I liked you better when you were yourself, not when you were trying to be like big brother 'Star Wars'. Swish down another dozen bottles of rum, an' get back to bein' an ol' drunken sailor you miserable pup! Yeah, I agree on some points, especially over the fact that I almost hope that it's the end of the series. I love Pirates of the Caribbean, but they're going a little far. I did however enjoy the film, but I'll be holding that ten bucks for a different movie. I hope we can agree to disagree on some points in this. Anyway, I wrote my own review in my own blog, if you'd like to read that.